For single cylinder diving, a simple low profile wing is ideal. It needs to have enough buoyancy to support us at the surface, and keep drag and clutter to a minimum. The Eclipse wing fulfils this role admirably.The wing sits snugly between the cylinder and the backplate, and offers no noticeable drag in the water. It has a doughnut shaped bladder so that air can transfer from one side to the other, regardless of the divers orientation in the water. This makes dumping, particularly from the rear dump, very simple and quick. Single tank wings need adapters to allow the cylinder to be attached to the backplate. Either the low-profile or the modular weighted adapter will work with the Eclipse wing. When you consider that you can choose between an aluminium or steel backplate, you have a very wide range of weighting options available with the single tank arrangement. Come for one of our demo-days, and weâ€™ll figure out the best combination for you. The Eclipse wing is made with the same high quality materials and standards as its bigger Evolve and Explorer cousins, and comes with the same level of after market support should it be required. 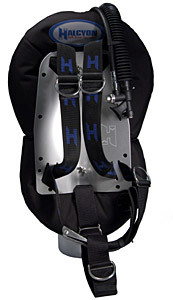 The Eclipse wing has a 30lb lift capacity, which is ample for most people in a wet or drysuit configuration. See the balanced equipment article for more information about the lift needed for a wing.